After a week of evenings spent tinkering, painting and gluing I’ve more or less completed the dollhouse furniture set. There are a lot of finishing touches and accessories I’d still like to make but they aren’t really part of the furniture, so for now I’ll just post the pieces by room like I’d planned, starting with the bathroom. Below I’ve included before and after photos of each piece as well as an explanation detailing what I did to finish them. The palate I chose for all of the furniture pieces was pink, purple, green and white so I had those four colors to choose from for the bathroom. 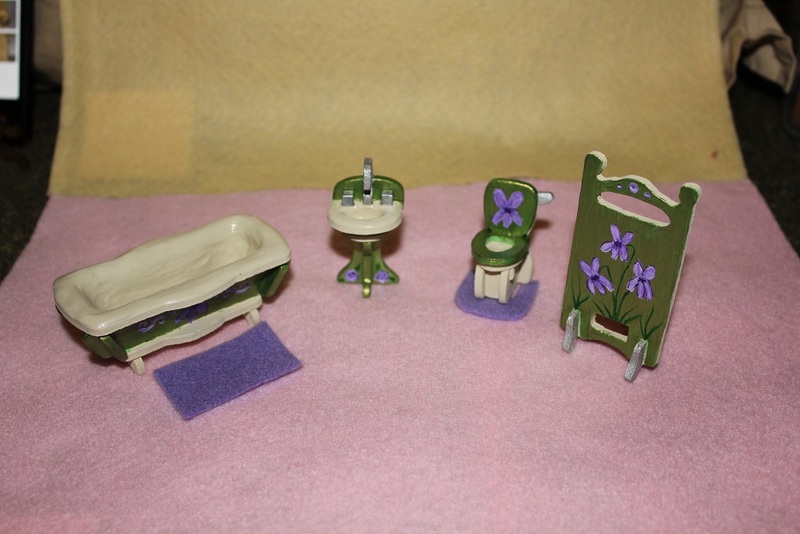 I’m partial to green and purple (as evidenced by our daughter’s bedroom) so the bathroom was done up in green, purple and white with violets because violets are my favorite flower and they’re easy to paint. As you can see by the before and after photos the transformation was substantial for the sink piece. 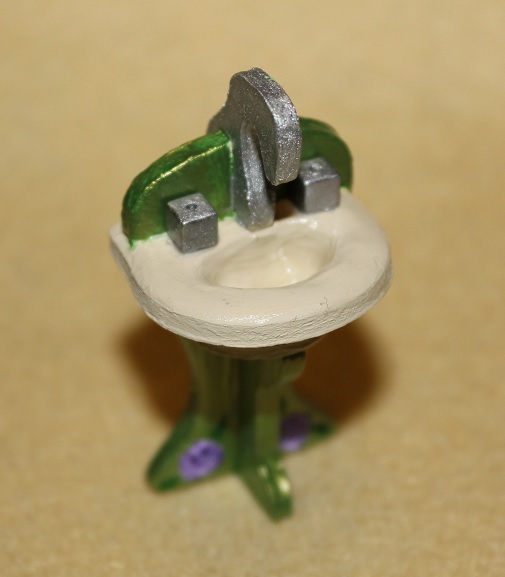 The first thing I did was I glued it together with thick superglue and fashioned a basin out of polymer clay. I did this by carefully smoothing a piece of clay into the basin area and then I baked the whole piece in the oven at the recommended temperature as per the clay instructions. 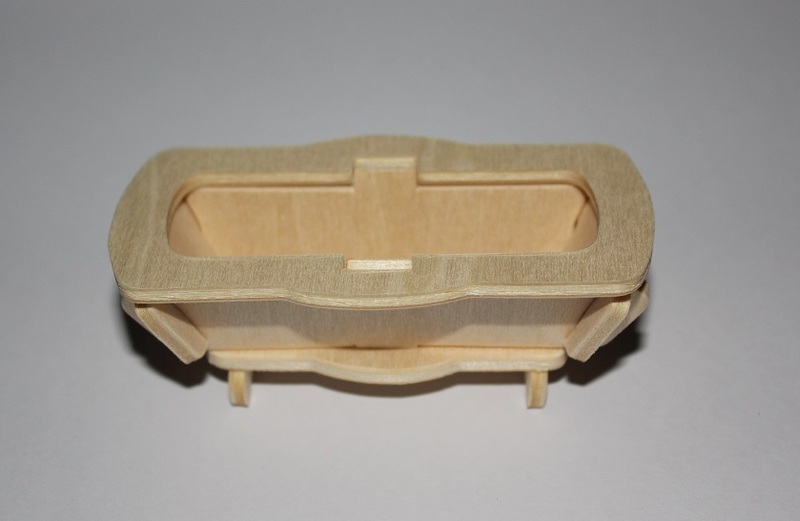 I often bake clay onto cardboard and wood because it bakes at such a low temperature in the oven for such a short period of time that the wood doesn’t ignite. The next thing I did was I painted the whole thing with off white (parchment) acrylic paint. The acrylic paint did make the wood swell slightly but I didn’t sand it because it would have been far too fiddly and it’s really not a big deal. After the paint was dry (about two coats later) I took some clear nail varnish and painted the basin to make it shiny like ceramic. While the various paints were drying I took two cube shaped beads to use as taps and painted them silver on a plastic plate. This took a few coats because they were so tiny and they were made of glass. Once the taps were coated in silver and dry I sealed them with clear nail varnish. I also painted the faucet silver to match. I did not glue the taps onto the sink until everything else was painted. Lastly, once everything else was dry I carefully glued on the taps. The next piece I’m going to detail is the divider. 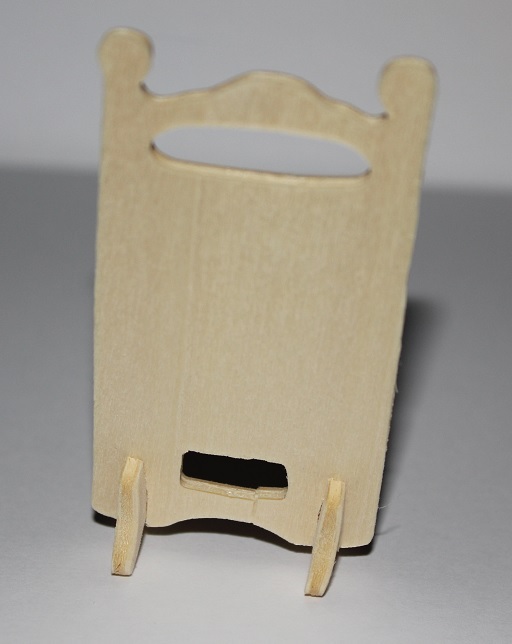 I’m not sure if it’s got a proper name but it’s just a free standing room divider piece that seems to be popular in dollhouse sets. Maybe it’s a changing screen? Anyway, all I did for this was I glued it together and then painted the whole thing in the matching parchment white color. Once the white was dry I painted the feet silver and one side green (2 coats). After the green was dry I was able to add in my violets detail. I left the other side completely white. 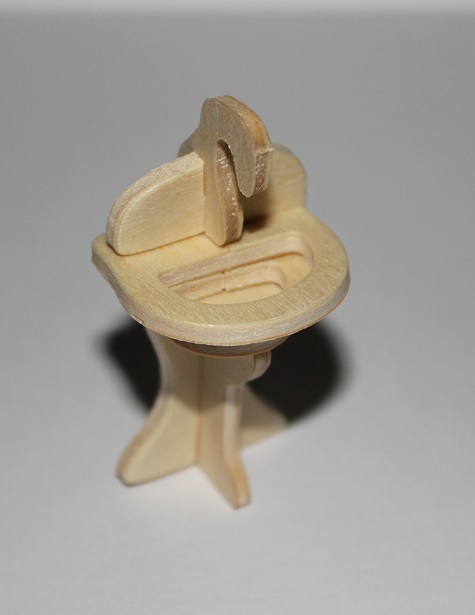 The toilet is adorable. 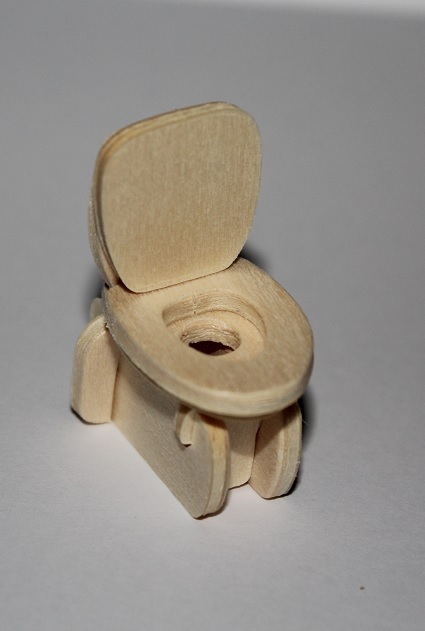 I did change the design from the photo on the package though because they had the flusher glued onto the toilet seat and that didn’t look right at all to me so I glued it to the back which means you can still see the little flusher sticking out. I glued the pieces together and painted them in the parchment white. Once that was dry I painted the flusher silver to match the faucet and taps on the sink. Then I added the green and finally the violet detail. The tub is probably the piece that I’m most happy with because it was such a monstrosity to start off. 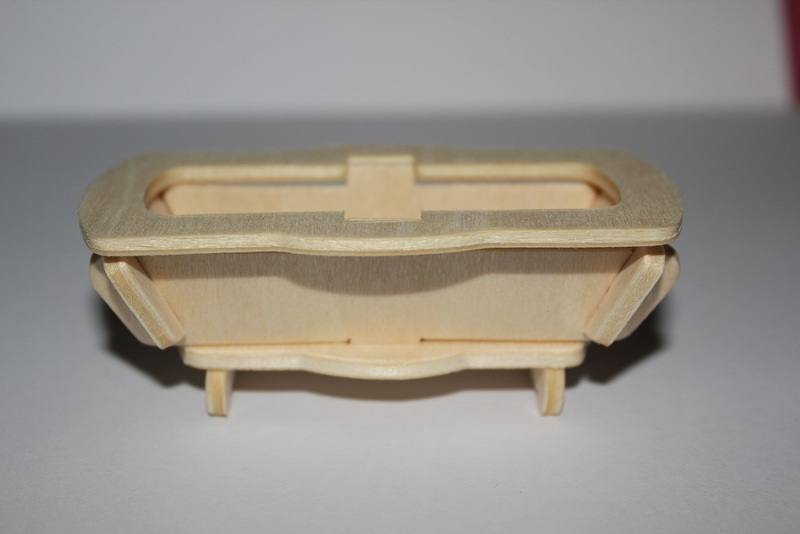 To be fair, designing a tub out of flat wood tongue in groove laser cut pieces isn’t easy so I can’t really fault the designers, they did the best they could but I wanted to make it better. 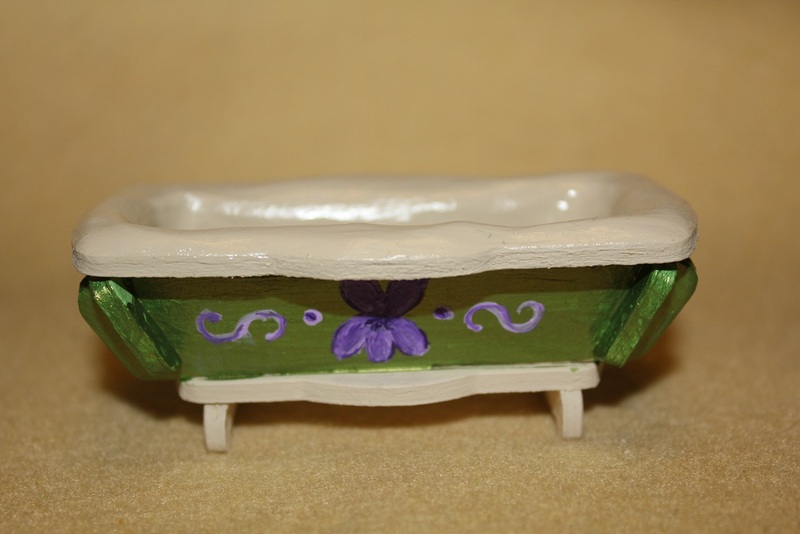 The first thing I did was I glued the pieces tofather and even when I squeezed the pieces as tight as I could get them the inside the tub was just gappy and horrible so I went back to the polymer clay and I gave it a nice smooth basin. I baked it just like the sink and it came out really well. The clay did have a couple hairline cracks as it shrinks every so slightly when it’s baked but I managed to cover them up with paint. Next I painted it with parchment white as with the other pieces and the inside of the tub got a coat of clear nail polish to make it shiny. Then it got the same treatment as the rest with green paint and finishing detail touches. Originally I hadn’t planned on applying any green to the tub or sink (just the toilet seat and divider) but I’m glad that I carried the theme through all the pieces. I’m extremely happy with how they all turned out.